Do I Need Emergency Tooth Extraction? Your dentist will work hard to help you maintain your healthy, natural tooth structure, but there are some situations when tooth extraction is the best option for your oral health. In many cases, these tooth extractions are performed during a dental emergency. If you experience facial trauma or injury that may require the removal of one or more teeth to restore oral health, you may be able to contact an oral surgeon to get the tooth removal services you need immediately. In this post, we’ll walk you through some of the dental emergency situations where you should contact an oral surgeon for assistance. When Should I Call an Oral Surgeon? 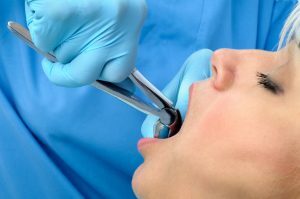 What Happens During Emergency Tooth Extraction? Our first goal is to relieve pain and protect you from additional dental damage. We start by administering local anesthetic and/or sedatives as necessary to ensure you are safe and comfortable. Then, we will make incisions in the gum tissue around the damaged tooth. In some cases, we also need to break the tooth into smaller parts to allow us to remove all of the tooth structure. Once the tooth is removed, we may need to stitch the soft tissue to ensure the site heals properly. Following your extraction, you will likely experience some discomfort, swelling, and bleeding for a few days. Any pain or inflammation should be manageable using pain relievers and cold compresses as directed. If pain persists for more than a few days or isn’t abated after taking pain relievers, you should call our office right away. Meet trusted Marietta oral surgeon, Jeff Lee, MS, MD, DMD. With years of advanced training and education in oral and maxillofacial surgery and anesthesia, Dr. Lee offers safe, effective tooth extraction and tooth replacement services for patients at Muskingum Valley Oral Surgery. We have two convenient surgical practices in Marietta and Cambridge. We welcome patients from all surrounding communities, and we provide same day urgent care during emergencies whenever possible. Please contact us right away if you or a loved one are in need of emergency surgical care. Comments Off on Do I Need Emergency Tooth Extraction?